Salvador and Mike unroll Reemay to cover a row of heirloom tomatoes. On Wednesday afternoon, the folks at Bee Heaven Farm were preparing for a chilly night. Farmer Margie Pikarsky asked visiting farmer Mike Libsch and farm hand Salvador to put the floating row cover, or Reemay, over the rows of heirloom tomatoes and beans. They are tender plants and do not like it when it gets too cold. 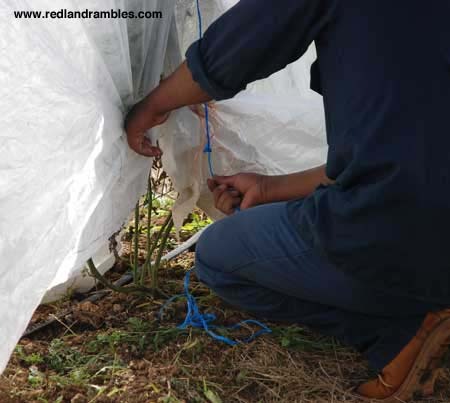 Mike and Salvador unrolled the bundles of light weight cover, and draped each row of tomatoes. They tied down the middle in sections with string, so that the cover wouldn’t billow and blow away, and the ends were knotted and secured. Reemay covered bush beans like a blanket, and clumps of straw bales held the edges down. The men worked quickly as the late afternoon sun sank in the clear sky. Salvador ties down the cover so it doesn’t fly around. 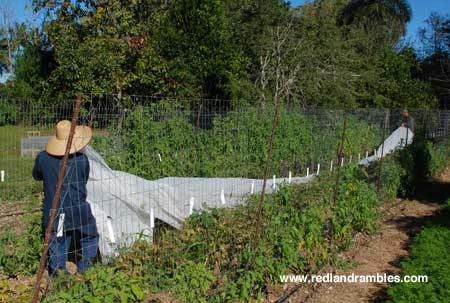 Reemay draped over tomato trellis before getting tied down. Bush beans got covered too. Better to cover up than to take a chance on getting plants destroyed by cold. Overnight, temperatures dropped as low as 36 in various areas in Redland. “This morning there was a lot of frost,” Margie said. The cover stayed on until frost was completely gone, around 8 or 9 in the morning. Tomato and bean plants looked alright, but Margie explained that cold damage doesn’t become evident until a couple days later. For now, the Reemay was rolled up and put away, until the next cold snap comes. 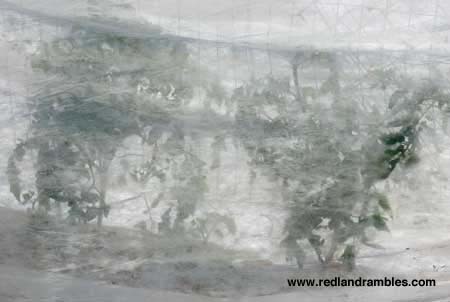 Note: Reemay is a spun polyester fabric that breathes, and will not burn plants it comes in contact with. 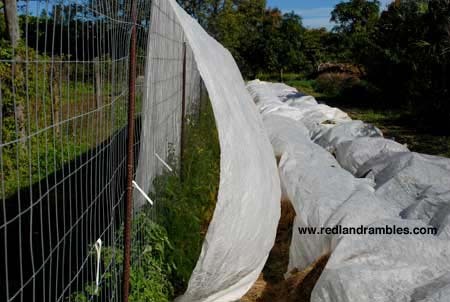 Plastic, on the other hand, will do that, and should be used only if there is a frame or support keeping it off plants. Heirloom tomato plants all covered up.